The DeZwaan windmill at Windmill Island Gardens has been a symbol of Dutch pride and heritage in Holland, Mich., for 50 years. If the iconic windmill could talk, its stories would fill a book. Luckily, Alisa Crawford, the first Dutch-certified miller in the Americas, who runs the present-day flour-making operation at the mill, took on that challenge. Her book, “DeZwaan: The True Story of America’s Authentic Dutch Windmill” profiles the windmill’s remarkable history. DeZwaan’s journey to America started in the small Netherlands town of Vinkel. The windmill was dismantled and shipped to Michigan in October 1964. The City of Holland purchased the windmill after extensive negotiations with the Dutch government, which had previously passed a law that no more windmills would be allowed to leave the country. DeZwaan ended up being the last authentic Dutch windmill to leave. Alisa Crawford, DeZwaan windmill’s Dutch-certified miller. Crawford said the idea for transporting the windmill was born out of a desire to have something to represent the Dutch culture and settlers who founded Holland. The windmill was dedicated in 1965 to great fanfare. “They really wanted it to be a working windmill, just as it had been back in the Netherlands,” she said. The mill uses stones powered by wind to grind grains from local Michigan farmers. The resulting whole wheat flour is sold at Windmill Island Gardens’ gift shop and is used by many local restaurants and shops. Crawford said she’s proud to make flour in the traditional manner, which is healthier than refined, processed flour. The process preserves all three parts of the grain, including bran, endosperm, and germ. “Those three parts are what you should be eating today,” she said. Windmills reached their peak in the Netherlands by the mid-1800s. At that time, there were approximately 9,000 windmills in a country that is one-fifth the size of the state of Michigan. They were used for a variety of manufacturing purposes, but one of their most notable uses was to pump water off the land. The country’s landscape was a big factor in their prevalence. “In the Netherlands, it’s a very low-lying country so they are prone to vast amounts of wind,” Crawford said. After the devastation of World War II, only about 900 windmills remained in the Netherlands. “It was a tremendous loss,” Crawford said. The impact of war can be seen on one of DeZwaan’s original windmill blades, which has 19 bullet holes peppered through it. The windmill actually served as a hiding spot for two Jewish men trying to escape Nazi soldiers. They survived and Crawford said the windmill literally helped save their lives. “Within its walls, way up in the top, hid two young Dutch men in order to escape notice of Nazi soldiers, and it’s a remarkable story of what they went through,” Crawford said. A scene from the 2013 film “Return to the Hiding Place” about Corrie Ten Boom’s teenage Dutch resistance army was even filmed at the windmill. Since the war, efforts to rebuild windmills in the Netherlands have brought the numbers back up to more than 1,100, Crawford said. In the United States there are fewer than 100 operational windmills. To celebrate the DeZwaan windmill, a Golden Anniversary Community Day will be held on Saturday, Sept. 5. This annual event marks 50 years in 2015 and is held as a way of bringing Hope College and the community of Holland together. Tickets can be purchased for the day in advance at the Events and Conferences Office located in the Anderson-Werkman Financial Center at Hope College, open weekdays from 9 a.m. to 5 p.m. Tickets will also be sold on Windmill Island Gardens on the day of the event starting at 9:30 a.m. They’ll cover the cost of a picnic lunch, admission to Windmill Island Gardens and an athletic game at Hope College. 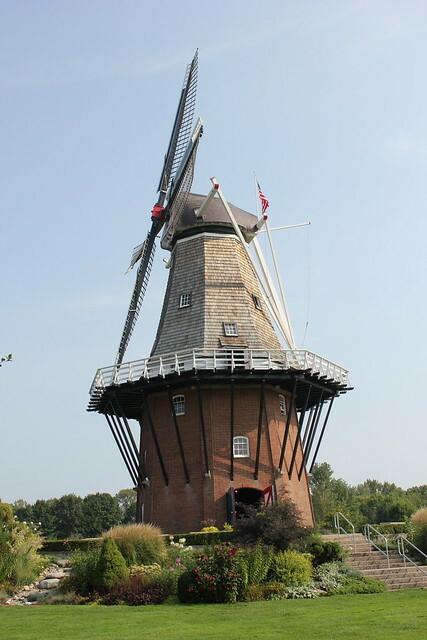 Check out our Flickr album below for a look inside Holland’s historic DeZwaan Windmill and a few other local highlights. Have you ever visited the DeZwaan windmill? If not, make plans to visit this Saturday during the Golden Anniversary Community Day. I love.. love.. love.. historical nuggets about the people than live in this great state…after all it is the people that make it great to live here. I have visited the windmill in the 80’s. I am looking forward to a soon revisit and you can best believe I will be tottin’ back a bag of the nutritious milled flour. Loved everything you included in your article. Thank you for a wonderful job done!. Thanks for reading, Kathy! We’re glad you enjoyed this post. by the way,,, the name DE ZWAAN means the Swan, but although its a beautyfull windmill i doubt it wil float on water like a swan does, lol.